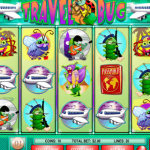 Travel Bug is a 5 reel, 20 paylines slot game released in 2008 by Rival. For some reason the theme revolves around the fun idea of travel and the not so fun idea of bugs. When you put them together this is what you get. Intrigued? read more below. The Wild in this game is the Ladybird which will substitute others to complete a winning combination. 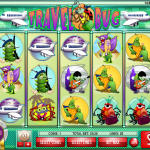 The scatters are the Bug-on-Suitcase symbol and landing 3 or more will win you 10 Free Spins. These are call the Cant Lose round. The wild will feel reel 1 and you will only need two symbols to win. 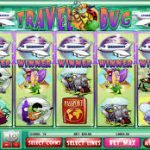 The second scatter is Passport symbol and 3 or more will trigger the Bonus Round. You will need to plan a trip with a given budget. The further you get the more you win so use your money wisely. If you’re a fan of old tv shows why don’t you try playing Swinging Sweethearts a 5 reel slot by Rival.